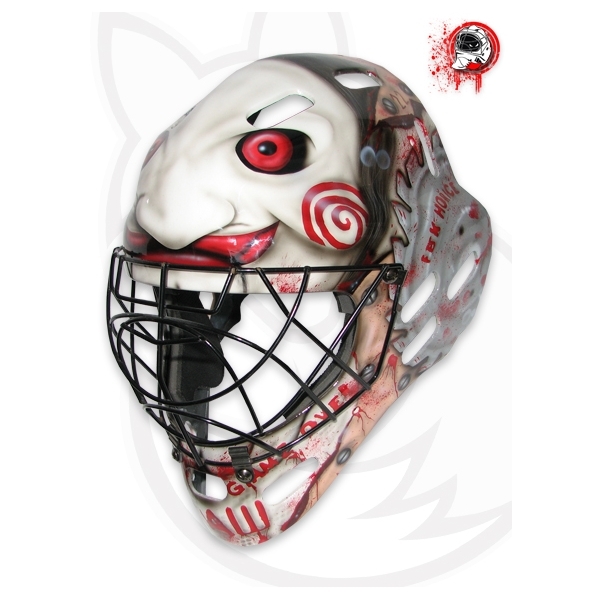 To many goalies a floorball mask is a window into their sole. Roman Vitek helps to open this window. An interview with one of the finest airbrush artists in the business. Lucie Moicicova’s motif might have been one of the quirkiest. 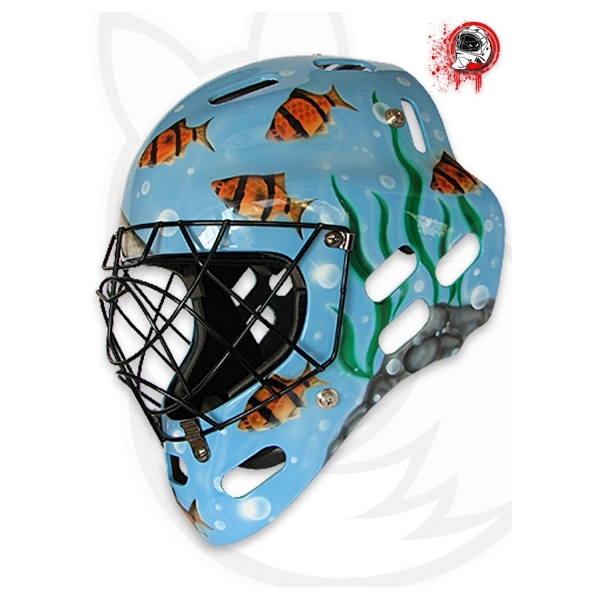 The young goalie wanted to place a whole aquarium on her new helmet. With every single fish. “But I didn’t ask why. I never do”, says Vitek. 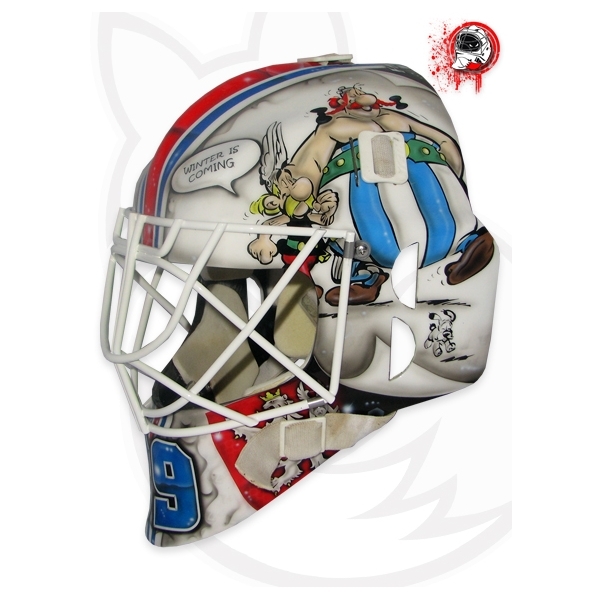 Klintsten, Rytych, Jansson and many other world class goalies have assigned the Czech airbrusher to design their helmets. They trust him, because he’s one of them. Vitek himself was guarding the goal of the Extraliga site Pardubice. Floorballmag: First of all, how did you become a professional airbrush artist? Roman Vitek: Actually all started by accident. 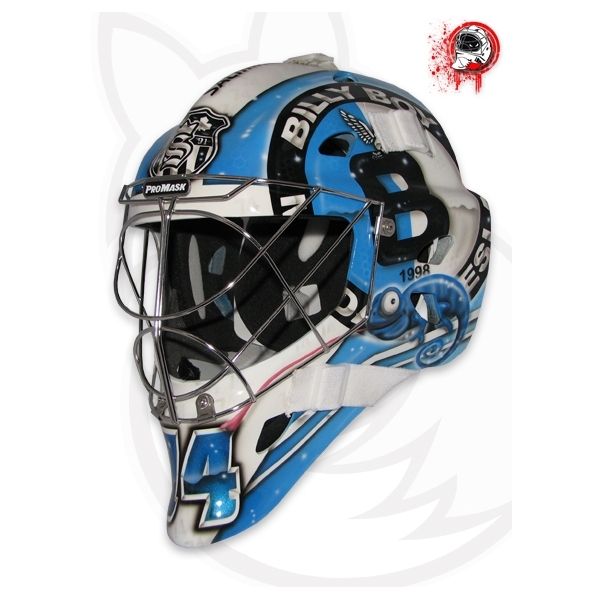 In 2009 I was still active for Pardubice and I wanted some individual design for my mask. I was kind of spoilt by the cool NHL helmets and presented my motif to some Czech airbrushers I got to know. They said, it’s too complicated and they sent me away to prepare something easier. But I wanted my motif. I thought, it won’t be any rocket science, so let’s do it on my own. I checked out some YouTube tutorials, borrowed a spraying gun from my former workplace and tried to beautify some kid’s training mask. It was far away from perfect, but I got crazy about airbrushing and started to spray at everything I got my fingers on. And how did you win your first customers? 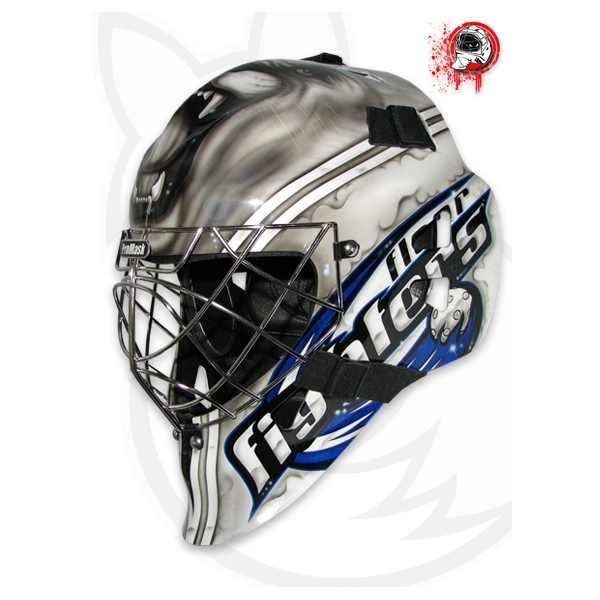 Some colleagues in the Extraliga saw my helmet and asked me to airbrush theirs, too. Suddenly my hobby turned into my occupation and in 2014 I became a pro. Nowadays I design helmets not only for floorball goalies anymore, but also for ice-hockey players, cyclists, paragliders, ralley drivers and kayakers. 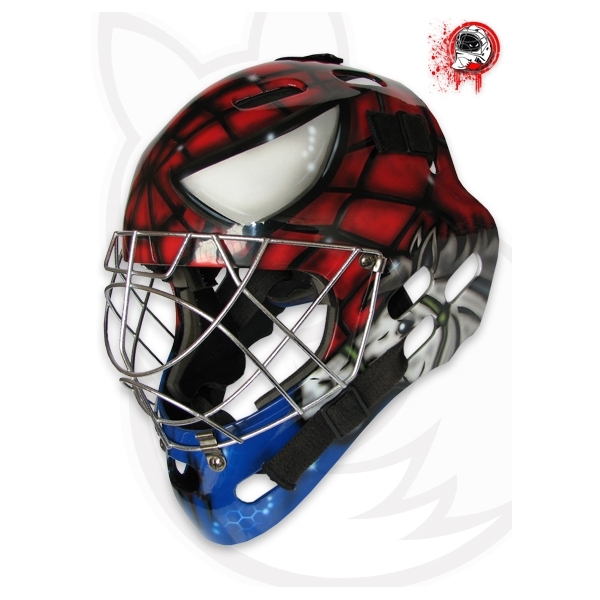 Why do you think do goalies have this need for individualized helmets? Goalies are different. No doubt. They wear different equipment and they have a totally different job on the field. To them a mask is something like a knight’s helmet. It’s not just protection, it’s their face and it’s sending out a visual message. And this message has to be something individual. Something that is difficult to get from regular brands. Exactly. Most brands offer standardized masks that are all the same. 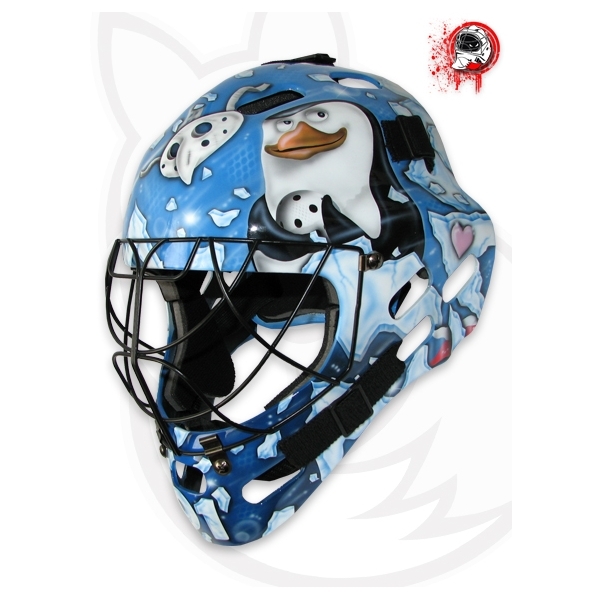 For a goalie, who wants to be an individual, perhaps even a special character, this is not appealing. Airbrushing allows to build a unique role, a motivation. On one hand you create a fictional character, on the other it’s a mirror of your mind. You can express yourself. 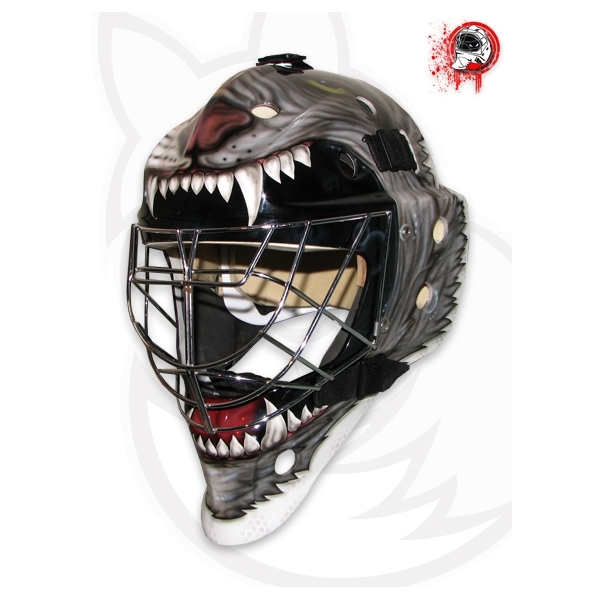 Put an aggressive wolf on your mask or your wife and kids, your favorite comic hero or dedicate your mask to your team. Regarding this individualization, is there any difference between the mentality of floorball and ice-hockey goalies? You can compare. Not really. There’s just a difference between goalies in higher and lower competitions. If you wear this mask every day, maybe many hours, you put it on and off a hundred times a week, then you have a more intense relationship to it. They look for some creative idea and proper quality, too. 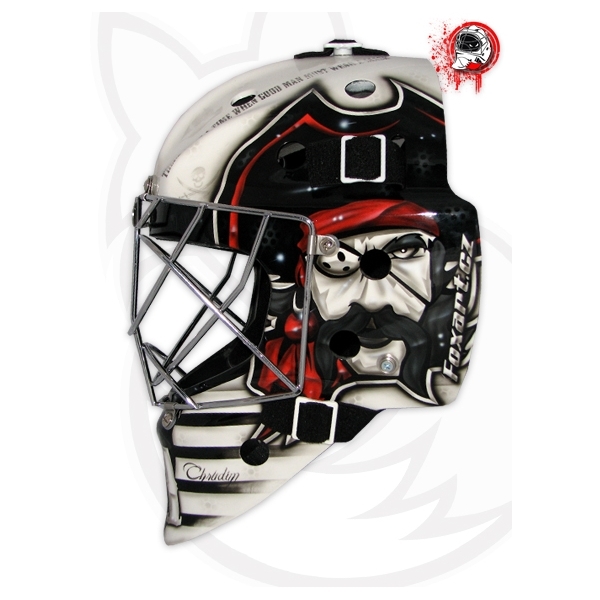 You might say, the more you love the game, the more you love your mask. What was your most demanding motif so far? That’s so difficult to say. So far I managed to do the job each and every time, so I guess I’m still waiting for the toughest nut. I enjoy every motif and I like challenges. I always edit drafts in a way so they look better and I enjoy them more. Then the customer will be happy, too. Is it possible to spray on every helmet? Theoretically, yes. But I would recommend to airbrush helmets with a rubber surface. And I don’t draw on masks that are already damaged. Mainly because it’s simply dangerous. I also don’t like masks that have many holes and screws and a dissected construction in general. It’s difficult to adjust the idea of the goalie with the technical possibilities. What would you recommend to a goalie who’s searching his perfect motif? What should he avoid? I’d avoid pictures of boyfriends and girlfriends. That never pays off. It makes sense to use colors that fit to your equipment or the team you play for. Use your club’s logo or your city’s crest. But a good airbrusher can make a cool design out of everything. It’s a clever craft that has no limits.